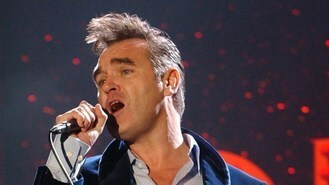 The ex-Smiths star has revealed aspects of his personal life in a new memoir, in which he also grumbles at length about the injustices of a court case about the band's royalties, as well as discussing his bitterness about record deals and his brushes with many famous names he has encountered. He reveals he was in his mid-30s when he met Jake Walters at a dinner he attended in Notting Hill. Morrissey wrote: " Jake and I fell together in deep collusion whereby the thorough and personal could be the only possible way and we ate up each minute of the day. "There will be no secrets of flesh or fantasy; he is me and I am he." Morrissey recalls how his neighbour, the writer Alan Bennett, had noticed the relationship had reached its end when he visited and pointed out to them: "You haven't spoken a word to one another since I arrived." The musician, whose much-anticipated book Autobiography has been published by Penguin Classics, also talks about his strong attachment to Iranian-born friend Tina Dehghani, whom he met while living in Los Angeles, saying of her: " Tina is my first experience of uncluttered commitment." "We take our place together almost without noticing," he wrote. And of their discussion about children, he said: "Tina and I discuss the unthinkable act of producing a mewling miniature monster." Morrissey, 54, calls his colleague Mike Joyce a "pounder drummer" when he discusses what he thought were the injustices of a lengthy court case in which Joyce and bass player Andy Rourke sought a 25% share of the band's earnings. And he calls guitarist Johnny Marr "a virtuoso of to-ing and gro-ing, you might swear that you are in the company of identical triplets as Johnny stands before you". Morrissey provides a forensic analysis of the court case - which he and fellow songwriter Marr lost - over many pages as he takes apart the witnesses, the lawyers and the judge. And he rails against the decision to increase the share of profits afforded to bandmates Joyce and Rourke, which was upheld on appeal. He is particularly venomous about Joyce's extensive legal claims on his royalties claiming he "grabs all he can", taking "£3 million - or thereabouts" of Morrissey's royalties under a later Smiths deal with Warner Records, which the singer called "a farce of unimaginable proportions".